AZZURRI STORM PLAYER REGISTRATIONS are now open. All players new and returning are required to register. MARK YOUR CALENDAR for May 6th. We look forward to seeing you on the fields! The Intent to Play process states your intention to be placed on an Azzurri Storm Youth Soccer team. It includes registration for the Player Evaluation Sessions, collecting your player identification number and tryout t-shirt at check-in, and attendance. Soccer evaluation (formally tryout) season is a challenging and stressful time of the year for our players, coaches, and families. It does not reflect the work the player has done over the course of the year and it is unfair for them to be assessed only on the basis of their performance in a 1-2-3 day event. As a result, our coaches and directors rely on a number of tools to evaluate a player to ensure each player is placed appropriately based on his or her tactical, technical, physical, and psycho-social development. 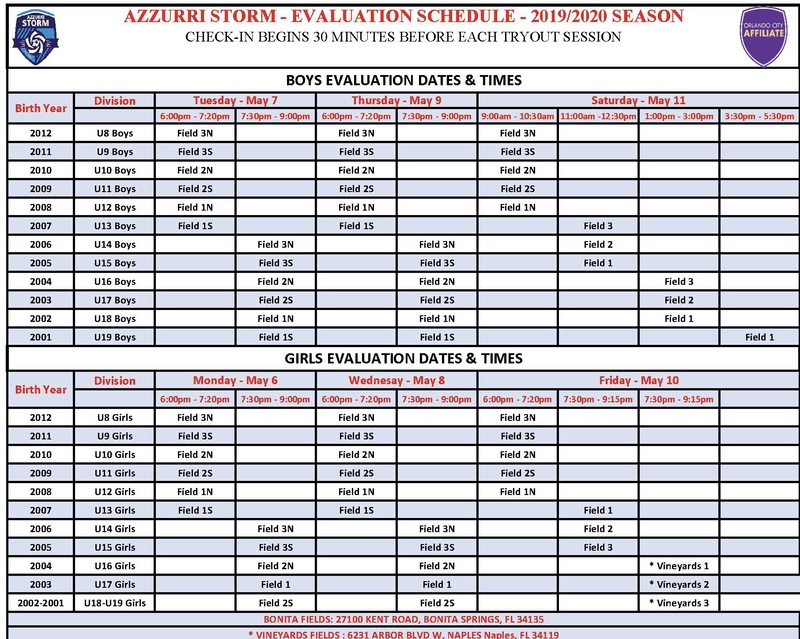 Although we use a year-round player placement process to evaluate current players within Azzurri Storm, we will continue to hold evaluation sessions to evaluate prospective players from outside the club. During these sessions, we look for very specific qualities in each player to ensure they are a good fit for our club and team culture. We use current players and teams to help gauge where a prospective player may fit within the structure of our club. Requests to “play up” must be made in writing to the board prior to the first evaluation date. If permission is granted, the player must first attend their age group and then move to the older age group for the remaining evaluation sessions for consideration. For more information, email john@azzurristorm.com. Team Offer: Current and prospective players will receive team placement offers within 24-48 hours. Player Registration: To secure placement on the team, players must register, select a payment plan, and pay the deposit within 48 hours. Upload a current photo of your player to their gotsoccer account at this time. Team Meeting: Your coach will arrange a team meeting prior to the 2019/20 season. We feel confident in the process to place players on the appropriate team and to help reduce stress, anxiety, and difficulties surrounding the tryout event for players and parents. Soccer Parenting Resource Center offers supportive articles and interviews for parents and players during the evaluation (tryout) process. Azzurri Storm values the well-being of our players, coaches, and families. Therefore, we will allow our teams and players to finish competing locally and statewide in lieu of early US Club tryout opportunities ahead of FYSA tryouts. As a club, we understand the pressure surrounding early commitments, especially for families unsure if a club or a team is a good fit. 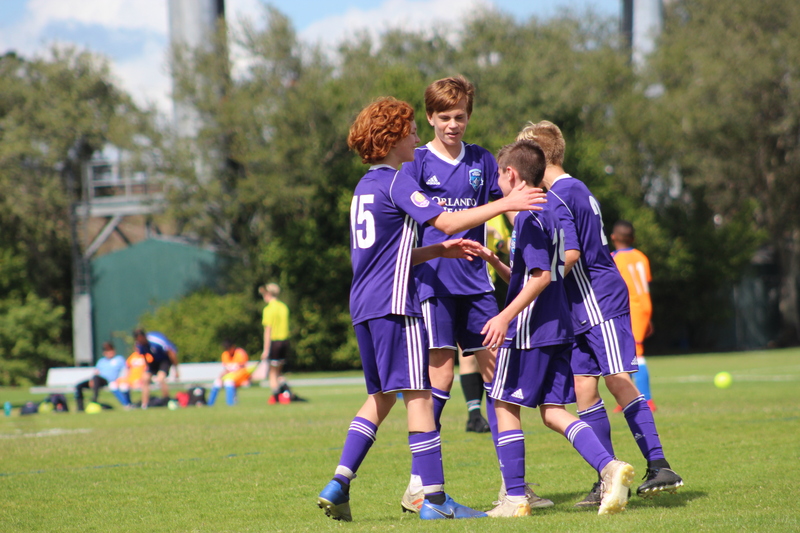 The whole process can be overwhelming, therefore, we will cater to our players first and offer FYSA tryouts under FYSA rules with respect to the state organization and our families. Our club has reached several milestones over the past few years (U.S. Club Soccer, Orlando City Soccer Club affiliation and Orlando City DA pathway, which was largely visible this year) and we are sure that our growth will continue as our club culture and coaching staff continues to improve and grow exponentially to include more high-level coaches, including former professional, and college players. Potential prospective players interested in joining our club and teams will show up and we are confident that our 2019/2020 season will be better than ever. Evaluations (aka tryouts) for rising U8 to U19 teams will begin Monday, May 6th through Saturday, May 11th. All new and returning players are required to attend all evaluation dates and MUST pre-register. If your player is unable to attend an evaluation session, email Karin Herrmann, club registrar, at registrar@azzurristorm.com and inform the observing coach on the field at an appropriate time. All “play up” requests must be made in advance to john@azzurristorm.com for approval.